Is it not gorgeous??? Believe me, it was VERY hard to give this one away but when she opened it and let out a shriek of delight it was all worth it! 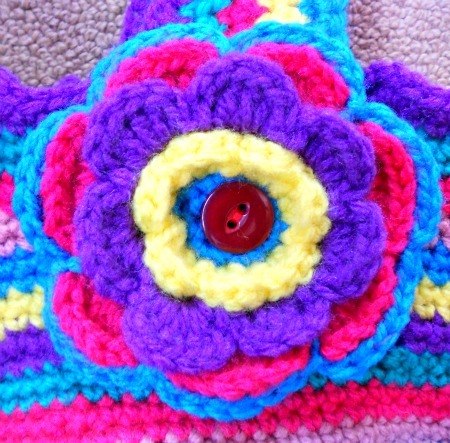 You may notice that I changed the pattern slightly and did two rows of single crochet in each colour instead of the original Lucy pattern of one row of trebles. 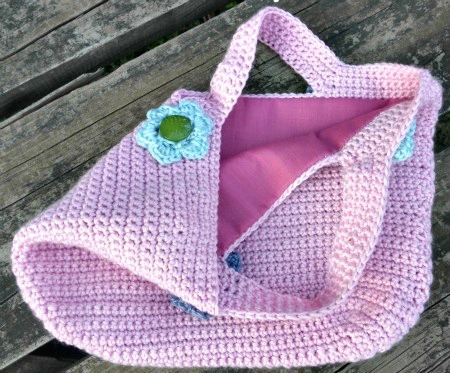 I crochet fairly loosely and having already made two of these bags, I had found that the treble pattern made the bag too 'holy' if you know what I mean. 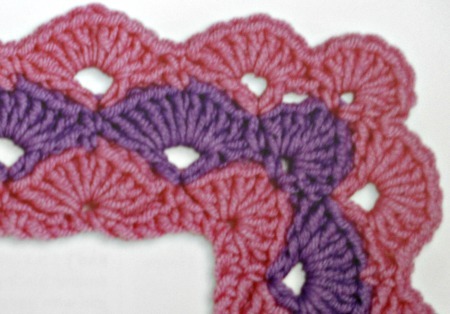 I did the increases the same as the original but just changed the stitch and this one came up much firmer and solid. I think I'll do all future ones like this as well. 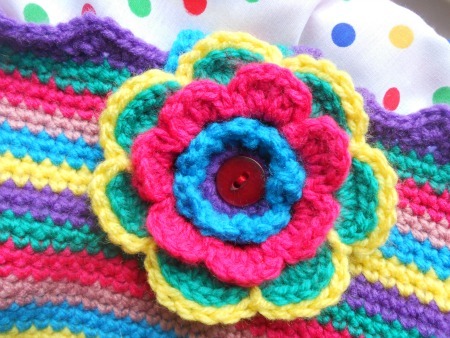 I used bulk standard cheap acrylic in jewel bright colours and then went for a seriously dotty lining! The flowers were also from Lucy but this time her Triple Layer Flower which are stunning!!! 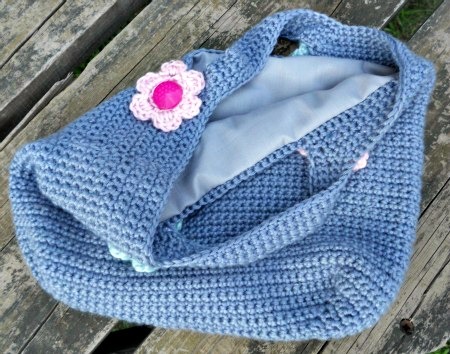 They're even better than her original Lucy Bag flower pattern so again, I'll be making these from now on for all future Lucy Bags!!! 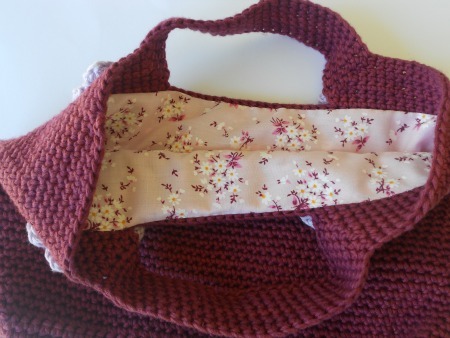 Don't you love that dotty fabric? It truly makes my heart sing!!!!!!!! I really hope my friend likes them! Is it not fab? 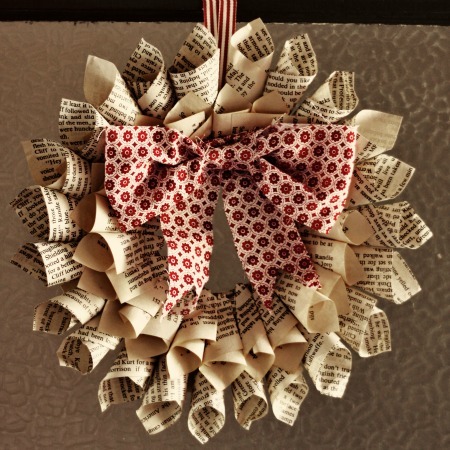 A Christmas wreath made of recycled pages from newspapers or magazines! I love it!!! I haven't made one yet but I want to, I really want to. 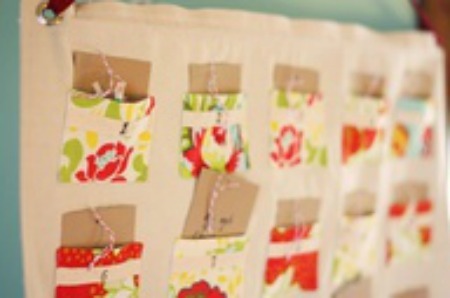 I love recycled stuff. We chuck away so much stuff that with a bit of thought, time and energy can be transformed into something useful or at least usable (if not always beautiful!). Anyway, this (to me) IS beautiful and the true beauty of it is that you can send it for recycling after Christmas this year and then make another one for next year!!! Genius! 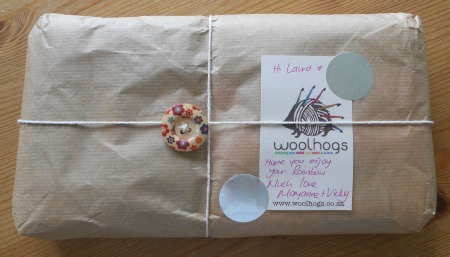 Said parcel was from Maryanne and Vicky at Woolhogs. I had won a prize!!!! Yes, can you believe it, me, moi and I had actually won something!!!!!!!! Yay! In all my 40 something years I have never (repeat N-E-V-E-R) won anything, so this was the hugest of huge things for me (can you tell?)! 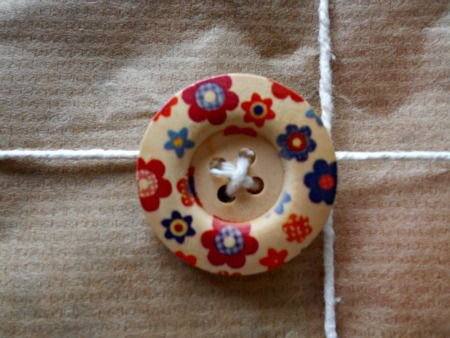 I had entered a little competition on Maryanne's blog and then the parcel came..... How's the cute button? What do you think? I know it's no haute couture but it's all mine! 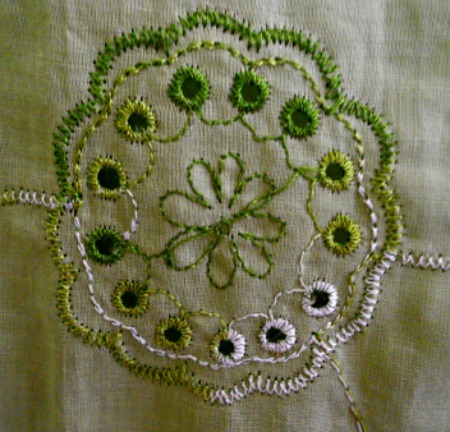 It's the most stunning apple green colour and there are these little embroidered punch outs in the fabric. Here's a close up. Aren't they pretty? I think so. 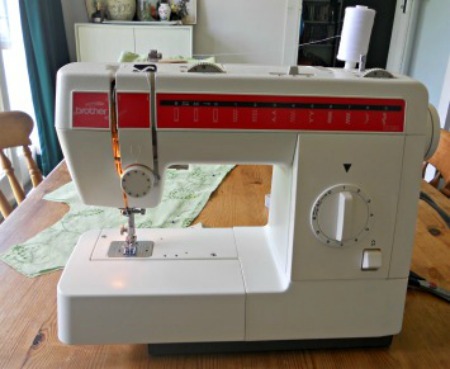 I have to tell you that my sewing machine and I have never had what you might call a real relationship. 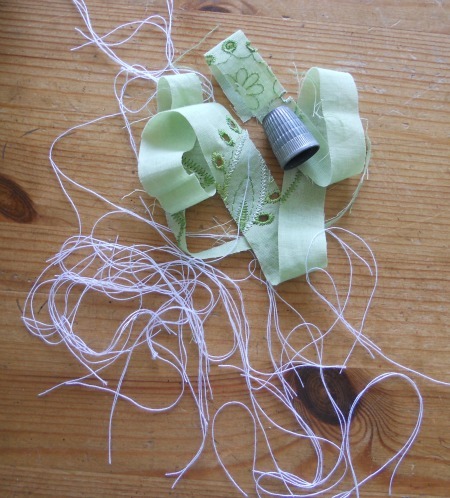 It's always been more of a battle of wills with the sewing machine usually winning! 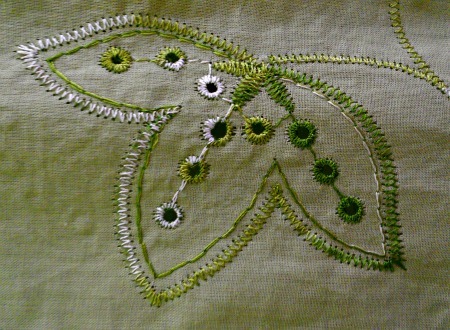 This time, however, I kept repeating the mantra "I am not afraid" the entire time I was sewing and it seemed to work!!!! The machine behaved itself and within 4 hours I had a dress!!! Yay! 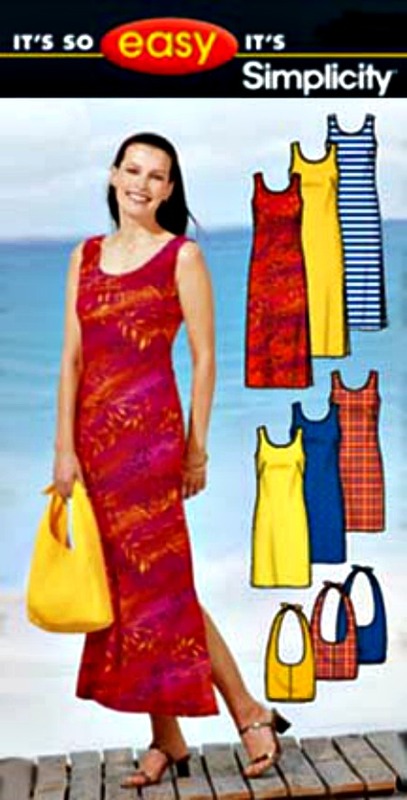 For those of you that are interested the pattern is Simplicity 5628. I'm sure there is a technical name for this kind of dress but I call it a 'straight up and down dress'. 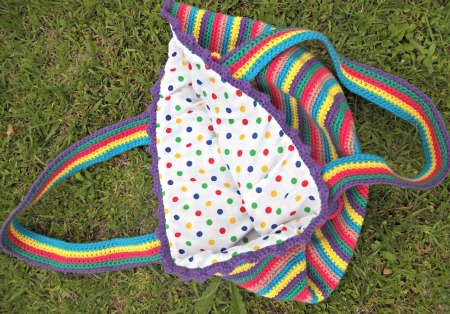 It's great for summer, especially here in South Africa, where it can get blindingly hot in December/January so I know this little gem is going to get alot of use. 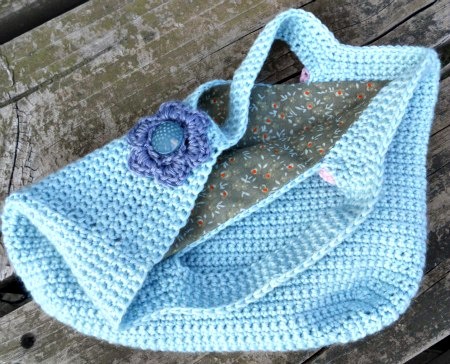 Cute bag too. That's me for now. What have you been up to? Is it not the most stunning garment you have EVER seen? I'm very jealous. Extremely jealous in fact. 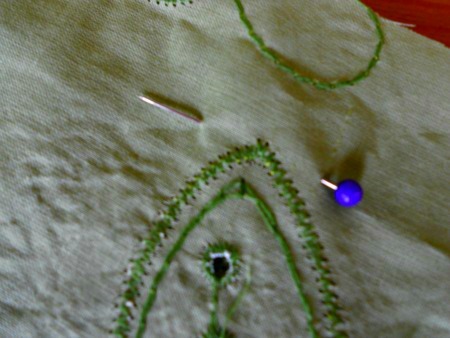 And to top it all Kristen made it up from a picture - yes you got it, SHE HAD NO PATTERN!!!!! 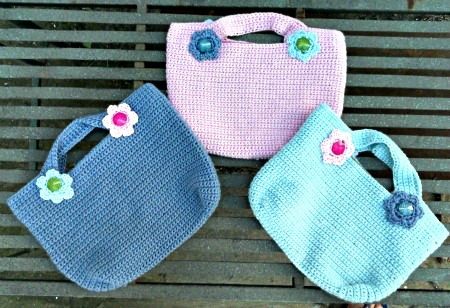 I work with three fabulous ladies and this year I decided to make them each a bag for Christmas. What do you think? 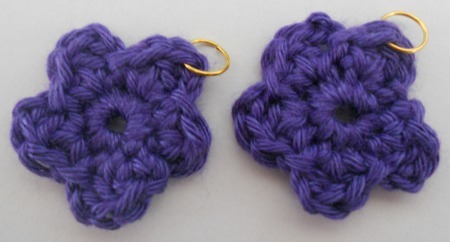 I was so pleased with them and they're really easy to make. 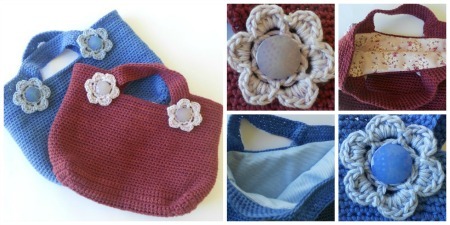 You can find the pattern here so please have a go because they are truly gorgeous!!! 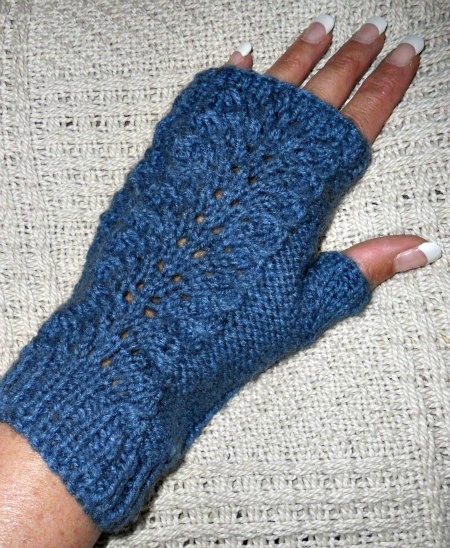 I used a baby double knitting yarn because I wanted them to be really soft and floppy and they were just perfect! 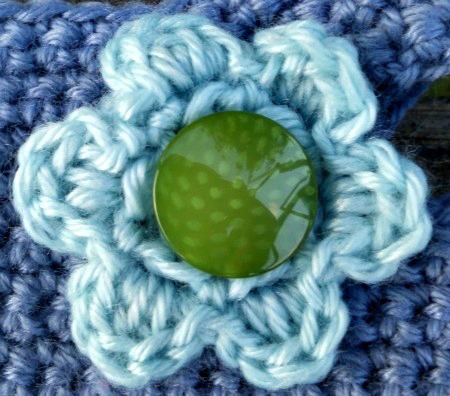 The flowers were Lucy's (of course) and you can find the pattern here and then the buttons I chose had tiny little white dots on them which reminded me of pollen inside a flower! 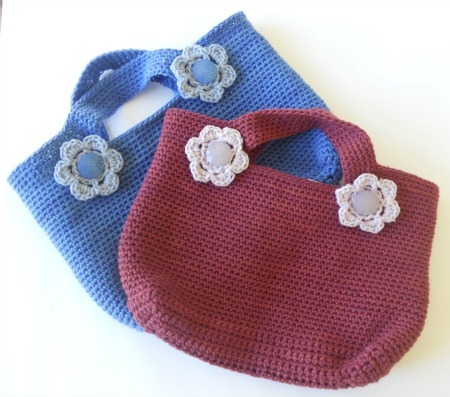 They're not huge bags so not great for that massive supermarket shop but for a local garden party, tea with the in-laws or a Summer fete they're just perfect! 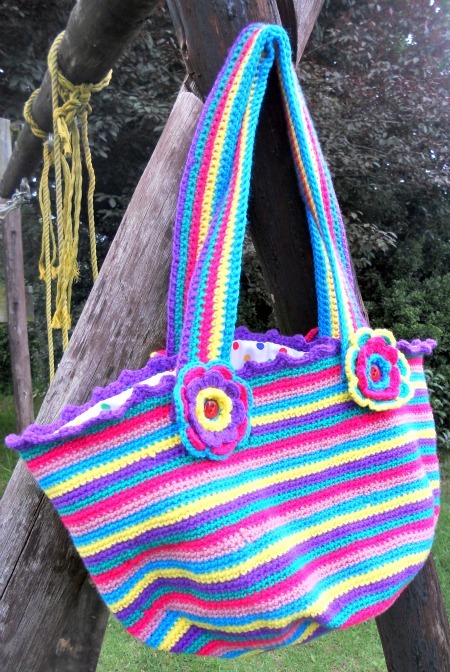 Or if like me you're a complete craft monkey, then you can always use them as knitting/crochet bags for small projects.......! Are these chairs not gorgeous? So simple yet so effective. If you don't have white chairs (as I don't with two young boys in the house!) you could always make or buy some slip covers. 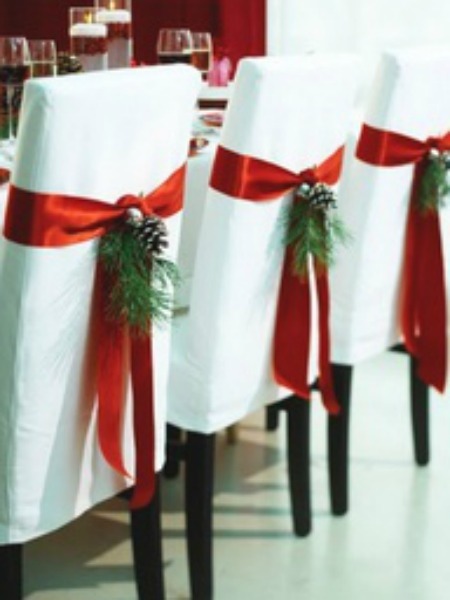 But even without the white chairs I think the ribbon, cone and greenery would look just as good. 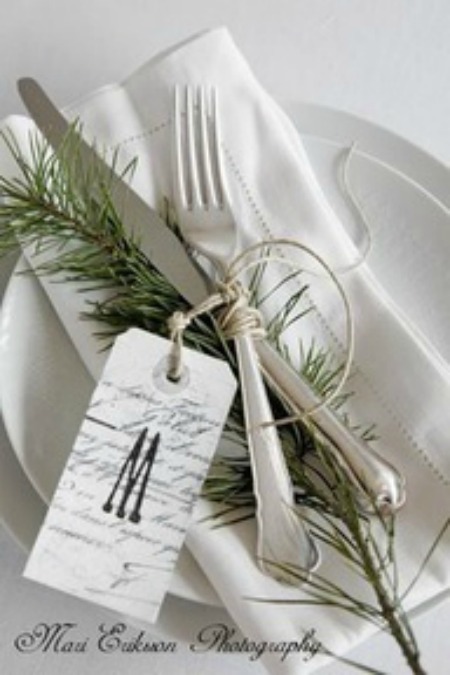 On the subject of the Christmas dinner table, I saw this place setting which I think is stunning. I'm not a huge fan of too much bling on the table and I think the simplicity of this setting defines its beauty. The tags you could easily find and print from the net and we can all find a bit of greenery. 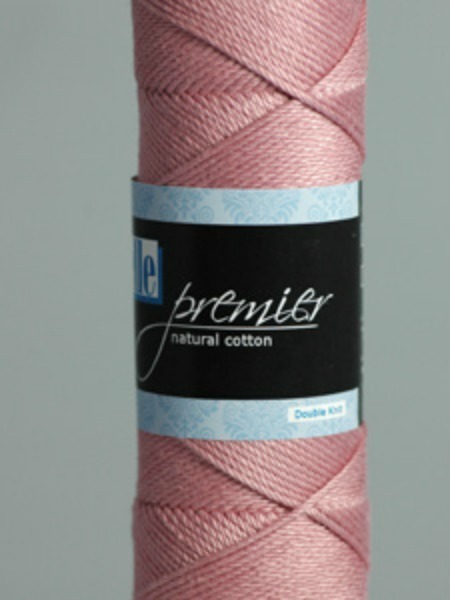 Tie this all together with a piece of natural twine and there you have it. Gorgeous. Moving on to all things wrapping, I'm always blown away by the diverse rolls of wrapping paper that are available. 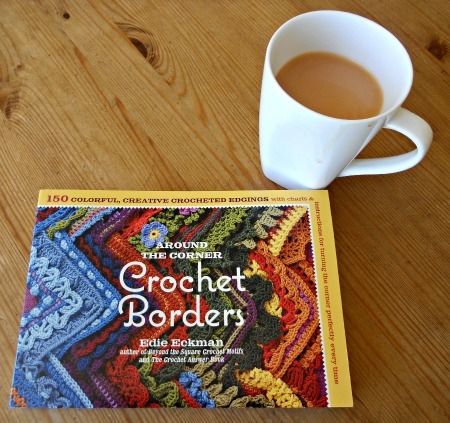 The patterns, the colours, the shininess (is there such a word?) of them all. 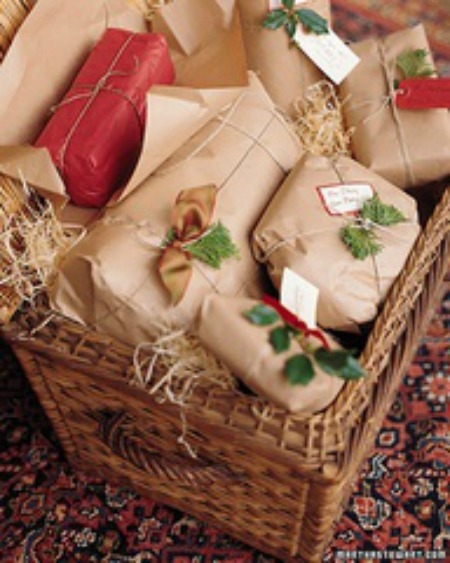 I must admit to loving them but when I saw this I thought how simple and beautiful and natural the pressies look. "Hug your dog three times today!" "Draw a Christmas picture and send it in the post to your grandparents." What do you think? 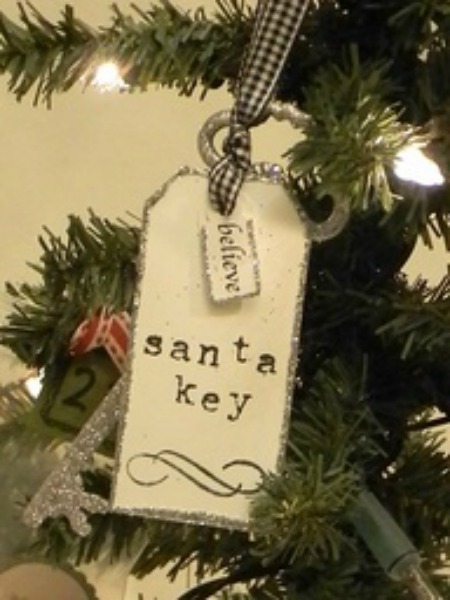 You could make them very specific to your child or your family or (even better) you could make one as a gift for someone but leave the tags blank, then they could fill them in themselves! I might make one for my classroom for next year but we'd have to do it through November as we always close at the end of November for our major Summer holiday! So that's what I've found so far. I'm by no means finished but have made a board on Pinterest so please feel free to pop over and have a look. Here's the link. Do you remember it? It is, of course, by the indomitable Enid Blyton and whilst she is not loved by all, she is certainly loved by me. She's had a bad press recently, particularly with the making of Enid (starring the fabulous Helena Bonham Carter) and although she was certainly an interesting person (to say the least) she was a terrific writer of children's fiction. Her reasons for writing her books and the deep rooted psychological traumas that caused her to escape into her magical worlds were of no consequence to me as a young child romping through her pages. 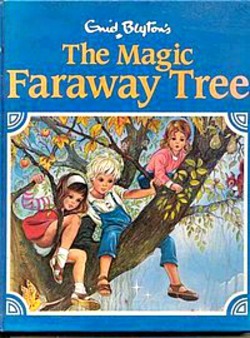 My entire childhood is one long Blyton memory when I stop to think about it and besides The Magic Faraway Tree (and the others that followed), I can remember Noddy, The Wishing Chair, The Adventures of Binkle and Flip, The Secret Island, The Secret Seven, The Famous Five, Amelia Jane, Mister Meddle, Adventures of Pink Whistle, The Children of Willow Farm and, of course, the entire Mallory Towers series! Now that I own a bookshop I am constantly amazed at how popular her books still are and not just to people of my age group who buy them from a purely sentimental aspect. Young parents buy them for their children to read now in this highly technological age of computers, mobile phones and playstations, and that fact pleases me immensely. I think Enid would have enjoyed it too. 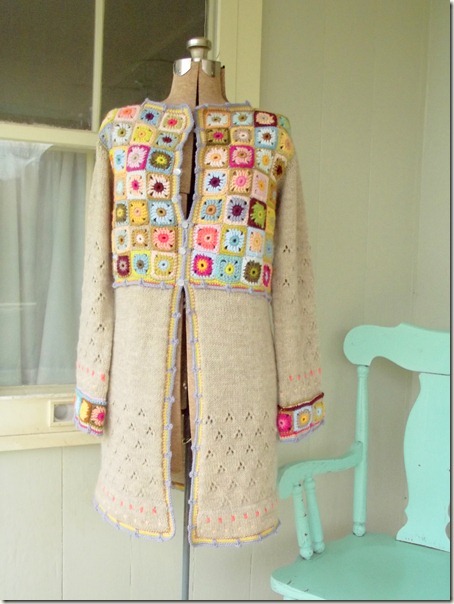 Daisy Cardigan - Ta Dah!!!! Hello there!! Long time no see.....I know, I know but there you are. Busy little bee and no time to blog but I'm here now and that's the important thing. Even more important is that I have a Ta Dah for you!!! It was a wonderful pattern. 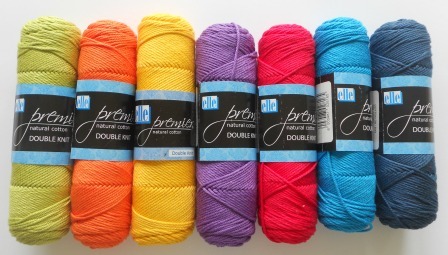 A freebie from Ravelry. 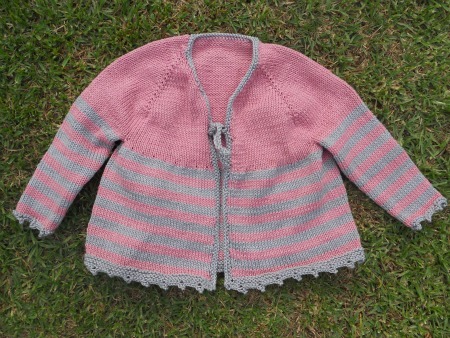 Here's the link to the Daisy Cardigan pattern. It's by Marie Grace Smith and was very simple. It's top down on circular needles and was my first top down project so it was extra special to get it right first time!!! 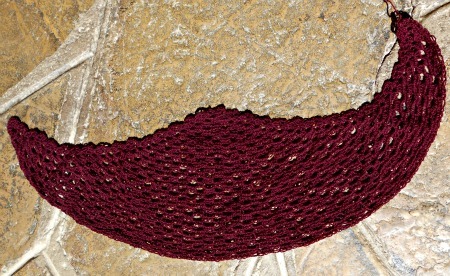 I'm in love with top down knitting now and intend to do many many garments this way. I love the way you can try it on as you go to make sure it fits and feels just right. Perfect. 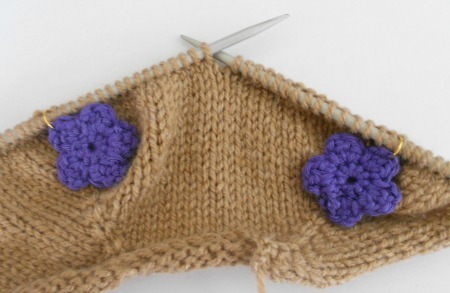 A while ago I discovered Kate who has a wonderful blog called Needled. 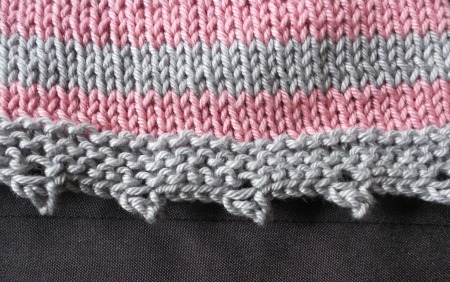 Not only is she the most amazing textile designer and her knitting patterns are lip-smackingly gorgeous, but she is also the survivor of a stroke which she suffered in 2010. I don't know her exact age at the time but I think she was in her twenties. When I first stumbled across her blog I couldn't believe that someone so fit and healthy could suffer a stroke at such a young age. Weren't strokes only for old people? How wrong I was. I read Kate's blog avidly and especially her posts about her stroke and her long and slow recovery. At the time I didn't know why I read them, I just did. With each one that I read I felt more and more humble in the light of what she had suffered. She is so brave and her courage shows through her posts like a beacon to anyone who is recovering from an illness. She takes life one day at a time and revels in small achievements no matter how mundane or insignificant. She is a true inspiration and I often wondered why I found her posts so interesting and enlightening. Now I know. As I've mentioned before a very close friend of mine suffered a stroke just two weeks ago aged 45. Whilst this cannot be compared to someone in their twenties, it still came as a huge shock to us all. A true 'it took my breath away' moment. As soon as I heard, however, I thought of Kate and her amazing journey and by going back and reading her posts I knew that my friend would come through this just as Kate did. Without the knowledge and detailed descriptions that Kate wrote, I'm not sure that I ever would have understood what my friend has been through but because of her blog I was able to find the strength to support her and her family through this very harrowing time. I'm pleased to say that she's doing well and is recovering daily. The neurosurgeon has said it can take from 3 months to 3 years to fully recover from the type of stroke she had so it's going to be a long road. All I can say is thank you Kate for 'finding' me and educating me before this event took place. Without your words it could have been much harder to bear. Was I meant to know about strokes in younger people? Most definitely. Did I find Kate's blog on purpose through some strange spiritual path? I'm certain of it. Are these type of 'meetings' coincidental? Not to me. Anyway, here's what I've been up to in the few quiet moments that I've had recently. Firstly, remember these lovely things that darling Shelley from all4meggymoo sent me a while ago??? It's a very basic pattern (trebles only) but it seems to be creating itself. I can't tell you how thrilled I am because it's like the yarn is deciding what it wants to be without any input from me. It's been so easy too. No frogging, no mess ups, no nothing. Just hooking merrily away and growing slowly and steadily which I love. 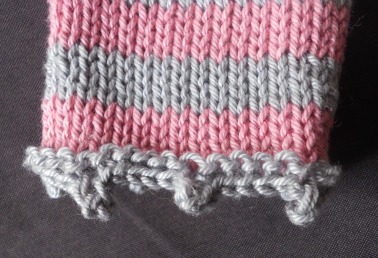 I know it's going to be beautiful and I can't tell you how soft this yarn is. It's going to be like wrapping myself in a cloud.... thank you Shelley soooooo much. What do you think? Will she like it??? I hope so. 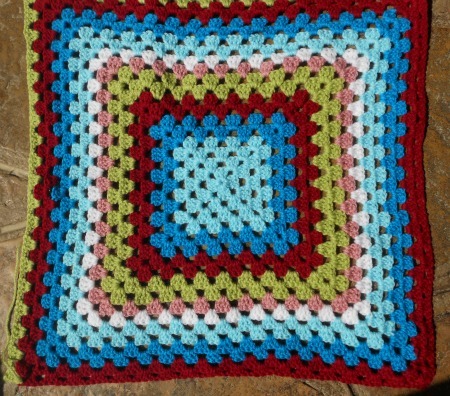 It's going to be a giant granny square and I'll just keep going round and round until I'm fed up with it. At the moment I'm totally besotted and could happily do it all day every day! Do you like it? This week was also quite momentous as I started a running program!!! I've always wanted to run and have tried before but it's never worked out for one reason or another. This time my hubby (he's soooo clever) found a program on the internet where you download podcasts for each week of your training. The podcasts are like having your own personal trainer with you and it guides you through your run with music. The music has the right rhythm for you to run / walk to and they tell you exactly when to run and when to walk. It's more of a jog for me at the moment (no-one could ever describe it as running!) but I'M DOING IT!!!! If you're interested in joining me and want to get fit (they reckon you'll be running 5kms in 9 weeks) then look at this link Couch to 5km - please let me know if you're using it - maybe I'll start a forum somewhere!!!! Anyway, that's me for now. Hope you're well and enjoying the Summer/Winter wherever you are!! !